One of the largest icebergs ever recorded has changed the outline of the Antarctic Peninsula forever. Experts say this will not result in sea level rises. 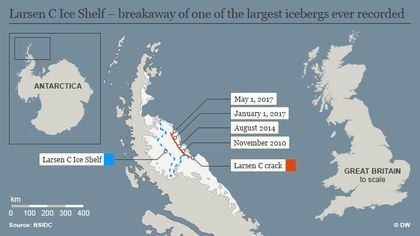 A 5,800-square-kilometer chunk of ice has separated from the Larsen C ice shelf, one of Antarctica's largest ice shelves. The new iceberg is one of the largest ever recorded. It weighs more than a million million tonnes and contains almost as much water as Lake Ontario in North America. 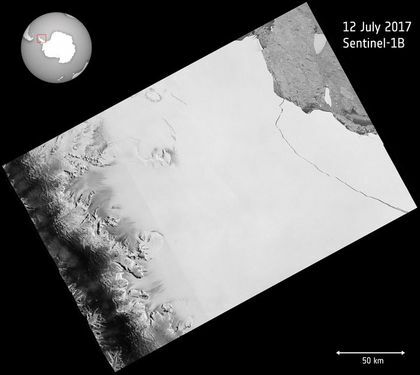 The Copernicus Sentinel-1 mission of the European Space Agency (ESA) discovered that a lump of ice more than twice the size of Luxembourg had broken off, changing the outline of the Antarctic Peninsula forever. The fissure first appeared several years ago, but seemed relatively stable until January 2016, when it began to lengthen. In January 2017 alone it travelled 20 km, reaching a total length of about 175 km. After a few weeks of calm, the rift propagated a further 16 km at the end of May, and then extended further at the end of June. ESA scientists announced Wednesday that the trillion-ton iceberg had finally broken away at some point in the last two days. “We have been expecting this for months, but the rapidity of the final rift advance was still a bit of a surprise. We will continue to monitor both the impact of this calving event on the Larsen C ice shelf, and the fate of this huge iceberg”, says Adrian Luckman, leader of Project MIDAS, an Antarctic research consortium led by Swansea University in the UK. Since the ice shelf is already floating, this giant iceberg does not influence sea level, and it will have little to no immediate impact on the region or its biodiversity. But scientists are worried about the long-term effects, because the iceberg’s progress is difficult to predict. It may remain in the area for decades, but if it breaks up, parts may drift north into warmer waters. The Larsen C ice shelf has now been reduced in sized by a record 10 percent. The loss of such a large piece is of interest because ice shelves along the peninsula play an important role in ‘buttressing’ glaciers that feed ice seaward, effectively slowing their flow. Two smaller shelves to the north have already collapsed. Larsen A disappeared in 1995, and seven years later Larsen B collapsed. "The collapse of Larsen A and B has been connected to warming ocean temperatures in the Antarctic Peninsula", Daniela Jansen, a geophysicist at the Alfred Wegener Institute for Polar and Marine Research in Bremerhaven, Germany, told Deutsche Welle. "The question is now whether the trend will spread toward the south and destabilize Larsen C, too", she added. 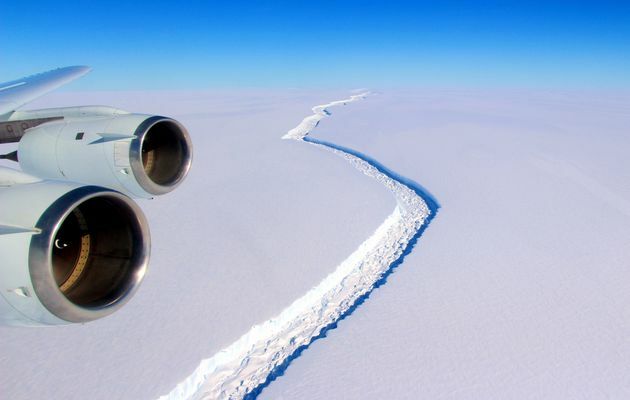 However, Luckman emphasised that there is no evidence that the calving of the giant iceberg is linked to climate change. Scientists will now be monitoring Larsen C to see if it follows the natural cycle and grows again - or melts further and eventually collapses.